Unless you're an extreme athlete, recovering from an injury, or over 60, you probably need only 50 to 60 grams of protein a day. And you probably already get that in your food without adding pills, bars or powders. Protein supplements come in a variety of forms including protein bars (left) and protein shakes (right). With more than $12 billion in sales this year, the industry is booming and, according to the market research company, Grand View Research, is on track to sell billions more by 2025. But do we really need all this supplemental protein? It depends. There are pros, cons and some ho-hums to consider. For starters, protein is critical for every cell in our body. It helps build nails, hair, bones and muscles. It can also help you feel fuller longer than eating foods without protein. And, unlike nutrients that are found only in a few foods, protein is pretty much ubiquitous. "The typical American diet is a lot higher in protein than a lot of us think," says registered dietitian Angela Pipitone with Johns Hopkins McKusick-Nathans Institute of Genetic Medicine. She says it's in foods many of us expect, such as beef, chicken and other types of meat and dairy. But it's also in foods that may not come immediately to mind like vegetables, fruit, beans and grains. The U.S. government's recommended daily allowance (RDA) for the average adult is 50 to 60 grams of protein a day. This may sound like a lot, but Pipitone says: "We get bits of protein here and there and that really adds up throughout the day." Take, for example, breakfast. If you ate two eggs topped with a little bit of cheese and an orange on the side, you already have 22 grams of protein. Each egg gives you 7 grams, the cheese gives you about 6 grams and the orange — about 2 grams. Add a lunch of chicken, rice and broccoli, and you are already over the recommended 50 grams. "You can get enough protein and meet the RDA before you even get to dinner," says Pipitone. So if it's so easy to get your protein in food, why add more in the form of powders, snack bars or a boost at your local juice bar? No need to, says Pipitone because, in fact, most of us already get enough protein in our diet. "Whole foods are always the best option rather than adding supplements," she says, noting the FDA does not regulate supplements as stringently as foods or drugs, so there could be less protein, more sugar and some additives you wouldn't expect, such as caffeine and even steroids. If you are considering a supplement, read the list of ingredients, she says, although this is not always foolproof. "I've seen very expensive protein supplements that claim to be high quality but they might not really be beneficial for the average healthy adult," she says. "It could just be a waste of money." But there are certain situations that do warrant extra protein. "Anytime you're in an anabolic state or building muscle," Pipitone says, such as if you're an extreme endurance athlete, training for a marathon, or you're a body builder. If you're moderately exercising for 150 minutes a week, as the Centers for Disease Control and Prevention recommends, or less than that, you're probably not an extreme athlete. Extreme athletes expend lots of energy breaking down and repairing and building muscles. Protein can give them the edge they need to speed along that process. Vegans can benefit from protein supplements since they do not eat animal-based protein sources like meat, dairy or eggs. And, for someone always on-the-go who may not have time for a meal, a protein snack bar can be a good option for occasional meal replacement. Also, individuals recovering from surgery or an injury can also benefit from extra protein. So, too, can older people. At around age 60, "muscles really start to break down," says Kathryn Starr, an aging researcher at Duke University School of Medicine, "and because of that, in addition to the fact that as we get older our body's ability to break down protein is reduced, the protein needs of an older adult actually increases." In fact, along with her colleague Connie Bales, Starr recently conducted a small study that found that adding extra protein foods to the diet of obese older individuals who were trying to lose weight strengthened their muscles. Participants in the study were separated into two groups — one group was asked to eat 30 grams of protein per meal in the form of whole foods. That meant they were eating 90 grams of protein a day. The other group — the control group — was put on a typical low-calorie diet with about 50 to 60 grams of protein a day. After six months, researchers found the high protein group had significantly improved their muscle function — almost twice as much as the control group. "They were able to walk faster, had improved balance, and were also able to get up out of a chair faster than the control group," Starr says. All 67 participants were over 60 years of age, and both groups lost about the same amount of weight. Starr is now looking into whether high-protein diets also improve the quality of the muscle itself in seniors. She's using CT scans to measure muscle size and fat, and comparing seniors on a high-protein diet to those on regular diets. She says her findings should be available in a couple of months. In the meantime, 70-year-old Corliss Keith, who was in the high protein group in Starr's latest study, says she feels a big difference. "I feel excellent," she says. "I feel like I have a different body, I have more energy, I'm stronger." She says she is able to take Zumba exercise classes three times a week, work out on the treadmill, and take long, brisk walks. Keith also lost more than 15 pounds. "I'm a fashionable person, so now I'm back in my 3-inch heels," she says. As people age, researcher Starr says muscle strength is key to helping them stay strong and continue living on their own in their own home. "I feel very much alive now," says Keith. "I feel like I could stay by myself until I'm 100." But can people overdo protein? Pipitone says you do have to be careful. Other researchers say too much protein can cause nausea, cramps, headaches, fatigue and bloating. Dehydration is also a risk when you eat too much protein. Pipitone says if you increase protein, you also have to increase your fluid intake. "I always tell people to make sure they're drinking enough fluids," which for the average person is 60 to 70 ounces a day, which translates into eight 8-ounce glasses of water or liquid per day. There have been some indications that extra protein makes the kidneys work harder, which could be problematic for individuals with a history of kidney disease and for them, the supplements may increase the risk of kidney stones, she says. Bottom line, if you think you need more protein in your diet, consider these questions: Are you are an extreme athlete; are you recovering from injury or surgery; or are you 60 years or older? If so, adding high protein foods like eggs and meat products to your diet can be beneficial. And, if you're not sure, it is always a good idea to check with your primary care provider. You can find protein supplements everywhere - online, at the pharmacy, at the grocery store. 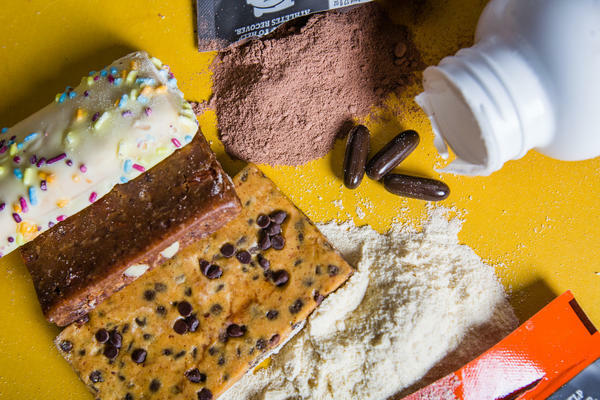 The protein industry is booming and is on track to sell over $12 billion worth of products this year. So many options - powders, bars, pills and more. But do we really need all this supplemental protein? NPR's Patti Neighmond reports. ANGELA PIPITONE: Beef, chicken, other types of meat, dairy. NEIGHMOND: ...And others that may not come immediately to mind. PIPITONE: Vegetables and some fruits and beans and grains. NEIGHMOND: The average adult needs anywhere from 50 to 60 grams of protein a day, which may sound like a lot, says Pipitone, but it adds up quickly. Take, for example, breakfast. PIPITONE: If you had two eggs, topped it with a little bit of cheese - the eggs are each going to give you 7. So that's 14 grams of protein with the eggs, and then a piece of cheese - probably around 6 grams of protein. NEIGHMOND: Add an orange, and you've got 22 grams of protein. A lunch of chicken, rice and broccoli and you're already over the recommended 50 grams. PIPITONE: You can get enough protein or meet the RDA before you even get to dinner. NEIGHMOND: So if it's so easy to get your protein in food, why add more in the form of powders, snack bars or a boost at your local juice bar? No need to, says Pipitone. PIPITONE: It could just be wasted money. NEIGHMOND: Because, she says, most of us get enough protein in our diet. And in fact, there are some people who need to be careful not to get too much protein - people with kidney disease, for example. Extra protein can increase the risk of kidney stones. Now, there are some situations that do warrant extra protein. PIPITONE: Anytime you're in an anabolic state or you're building. That would be, you know, extreme endurance athletes, bodybuilders and, you know, times like pregnancy. NEIGHMOND: And as we get older. Kathryn Starr is an aging researcher at Duke University School of Medicine. She says that at around age 60, muscles really start to break down. KATHRYN STARR: And because of that, in addition to the fact that as we get older, our body's ability to break down protein is reduced, the protein needs of an older adult actually increases. NEIGHMOND: Starr recently studied whether adding high-protein food to the diet of older individuals made a difference in muscle strength. The answer - yes. STARR: Participants in the higher protein arm were able to walk faster. They had improved balance, and were also able to get up out of a chair faster than the control arm. NEIGHMOND: Starr is now looking into whether high-protein diets improve the quality of the muscle itself. She's using CT scans to measure muscle size and fat, comparing those on a high-protein diet to those on regular diets. Her findings should be available in a couple of months. But for 70-year-old Corliss Keith, who was in the high-protein group, it's clearly made a difference. CORLISS KEITH: I feel excellent. I feel like I have a different body. I have more energy. I'm stronger. I'm able to do an hour of Zumba three times a week, and I do the treadmill. I walk. NEIGHMOND: An added benefit, she lost over 15 pounds. KEITH: I'm a fashionable person, and now I'm back into my three-inch heels. NEIGHMOND: And like many older Americans, Keith says healthy muscles are keeping her strong and independent. KEITH: I feel very much alive now. I feel like I could stay by myself until I'm 100. NEIGHMOND: And muscle strength is key, says researcher Starr, for older people like Keith to stay strong and continue living on their own. (SOUNDBITE OF THROWING SNOW'S "GLOWER") Transcript provided by NPR, Copyright NPR.